Yes, I think so. In fact, the more I think about it, I think it would make a perfect gift for anyone who is about to embark on a new adventure in life. Feel5ive helps lessen anxiety, and since venturing into the unknown comes with understandable anxiety, nothing could be more perfect. making it through some horrible "probationary period" - not hanging on to that job. Consider the high school graduate who is eager to head off to college in a couple of months – and terrified of being on his or her own for the first time. Consider a new bride who is anxious to make a good impression on her sweetheart's family – by inviting everyone to dinner. Feel5ive can keep her calm enough to actually get the food on the table. If you think about it, there are all sorts of positive life situations that can cause us to be filled with fear, anxiety, self-doubt, and apprehension. What could be nicer than to give a friend a gift of "Feeling better?" I wonder if those aren't just the kinds of situations Dr. Bach was thinking about when he created this blend. We'll never know that, but those of us who know about the power of flower essences know that Feel5ive will help. Who do you know who needs you to visit FeelBach! and order Feel5ive? Did you know that illness isn't primarily caused by germs floating in the air or some hereditary disposition , but by stress? A report from Stanford University study states that 95% of all illness was caused by stress. much stress we allow into our lives. I know – it's tough today. Worry over the economy, worry over world affairs, worry over terrorism – worry, worry, worry. And then on top of that we worry about our families – and of course our own health and finances. We have two avenues to reduce the stress in our own lives. One is our own mind power. We can make the conscious choice to think about good things instead of bad things. We can feel gratitude for the people we love, the good work we do, the activities we enjoy, etc. But yes, I know. It can be hard to turn your thoughts to the good when you're so worried. 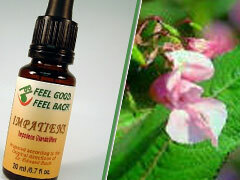 Dr. Bach's flower remedies can help get you into a balanced state where you CAN turn your thoughts toward good things. For instance, a person in the negative Aspen state already deals with uneasiness and fears that take no concrete shape. The uncertainty in today's world could serve to intensify these fears. After all, we can't individually "fix" the world - but we can individually care for ourselves and do all in our power to remain healthy.